In previous blog posts we’ve looked at how to use OData clients, like the PowerPivot plugin for Excel, to create sophisticated reports based on the data exported from your Questionmark Analytics results warehouse. In this post, I’ll show you that your web developers don’t need a complex tool like Excel to harness the power of OData. There are several third party libraries available that make it easy for your developers to incorporate support for OData in their applications, but OData itself contains a powerful query language and developers need nothing more than the ability to fetch a URL to take advantage of it. For example, suppose I want to know what percentage of my participants have passed one of my exams. By adding /$count to the URL I’m asking OData not to send me all the data, but just to send me a count of the number of items that it would have sent back. The result is a tiny plain text document containing just the number. If you view this URL in your web browser you’ll see the number appear as the only thing on the page. I’ve now calculated the total number of results for my assessment without having to do anything more sophisticated than fetch a URL. But what I really want is the percentage of these results that represent a pass. It turns out I can use the same technique as before to filter the results and include only those that have passed. My assessment has Pass/Fail information represented using the ScorebandName. Notice that by combining $count and $filter I can count how many passing results there are without having to view the results themselves. It is now trivial to combine the two values that have been returned to your application by these URLs to display a percentage passed or to display some other graphic representation such as a pie chart or part filled bar. As you can see, your developers don’t need a sophisticated library to write powerful client applications with OData. And these HTTP documents are just a few bytes in size so they won’t use much bandwidth (or memory) in your application either. For additional resources and definitions of all the OData filters, you can visit the OData URI conventions page at odata.org. Questionmark Users Conferences offer many opportunities to learn more about Questionmark Analytics and OnDemand. Registration is already open for the 2014 Users Conference March 4 – 7 in San Antonio, Texas. Plan to be there! What it does: The item analysis report provides an in-depth Classical Test Theory psychometric analysis of item performance. It enables you to drill-down into specific item statistics and performance data. The report includes key item statistics including item difficulty p-value, high-low discrimination, item-total correlation discrimination and item reliability. It also provides assessment statistics relating to the amount of time taken and the scores achieved. Who should use it: Assessment, learning and education professionals can use this report to determine how well questions perform psychometrically. The summary table beneath the scatter plot graph contains a line item for every question on the assessment. 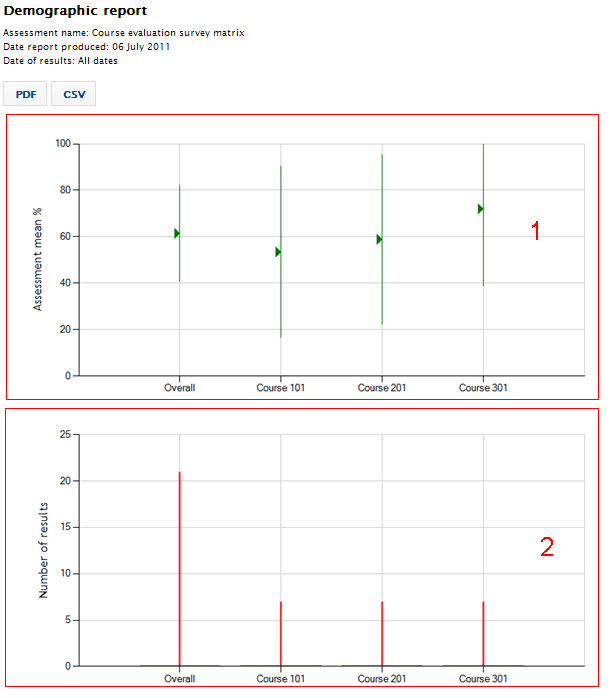 The table provides information on the question order, question wording and description, and summary information regarding the item difficulty p-values and the item-total correlation discrimination for each question. You can select an item in the table to navigate to the details of the selected item. 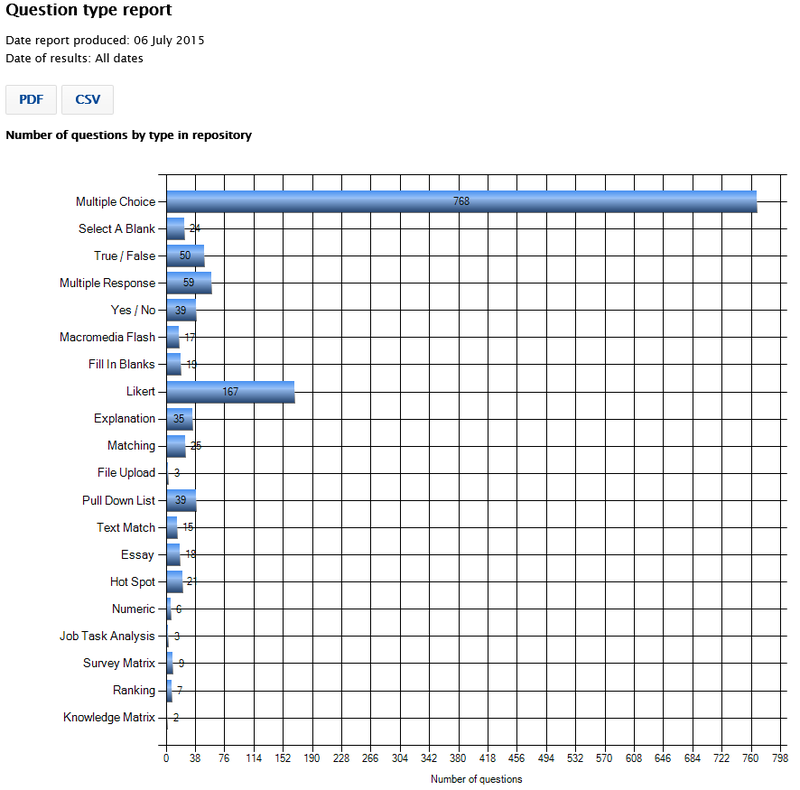 And you can sort on each column to get different views of question performance. For example, you can sort the questions by difficulty to look at the hardest questions at the top of the table. By clicking on any of the rows in the summary table one can go to a detailed item view of question-level information. What it does: The demographic report breaks down results by demographic variables such as language, course name, location, department, instructor, and job role or military rank. This report can recognize up to 10 demographic variables recorded by an assessment. Users can review the performance of assessment data broken out by a demographic variable, using data stored in special fields within the database. Who should use it: Assessment, learning and education professionals can use this report to zero in on test results according to specific demographic information. How it looks: Graph 1 in this example shows the assessment mean score for the selected demographic. It displays the average percentage score achieved as well as the high and low results. Graph 2 shows the number of results for the selected demographic and includes an overall calculation of the number of results found. 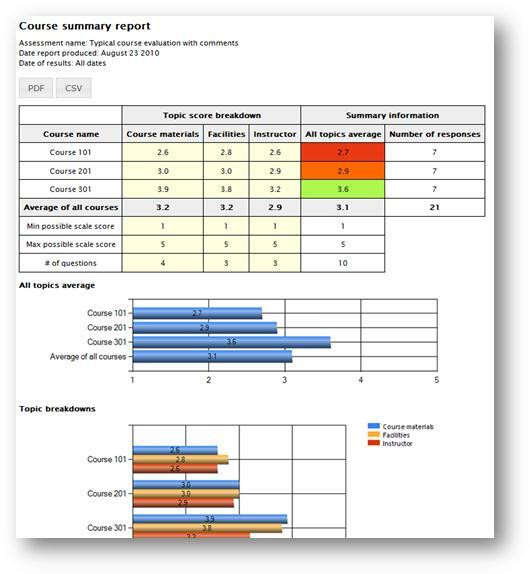 What it does: The assessment completion time report graphically monitors how long, on average, it took each participant to complete an assessment in relation to his or her overall score. For example, someone who took very little time to complete the assessment but achieved a very high score would be flagged. Might this person have had prior knowledge of the exam (e.g., prior exposure to the answer key)? On the flip side, someone who took a very long time to take the assessment but scored very low would be flagged, too. Might this person have been memorizing questions (i.e., taking exam content to sell to other test takers)? 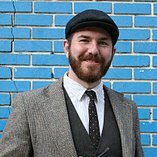 Who should use it: This report provides valuable test security information for those administering medium/high stakes tests. It can also be used to help determine whether the allotted test taking time window is sufficient for most participants. How it looks: The scatterplot shows the assessment mean for each participant (X-axis) plotted by the assessment completion time for each participant (Y-axis). 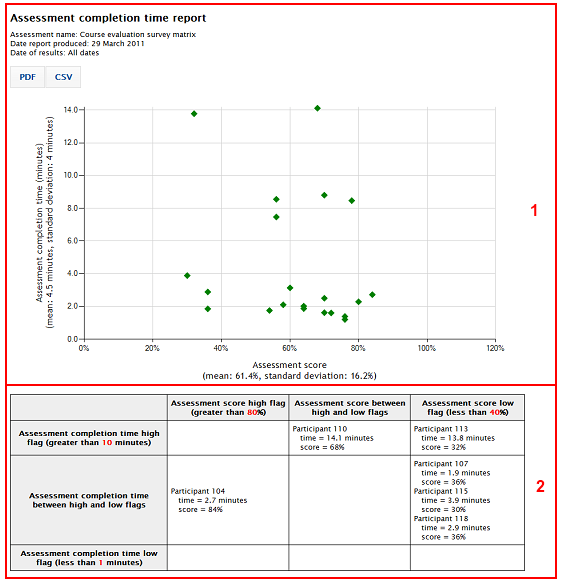 Clusters of participants that stand out as having extreme combinations of assessment score and assessment completion time are evident in the scatter plot (e.g., participants with short completion times and high assessment scores would stand out in the lower right section of the graph). Below the scatter plot is a table that lists participants that are flagged as having suspicious combinations of assessment score and assessment completion time. This list can be useful in conducting an investigation of what happened in a given context. Click here to learn more about Questionmark Analytics.